Each used armored vehicle comes from brand name automotive dealers including Ford and General Motors. Here you'll find a variety of bulletproof trucks and cars including money transport vehicles, prisoner transport vehicles, used armored SWAT vans and a host of other tactical vehicles. Our used armored cars and used armored trucks can give you the level of protection you need. Choose your used armored vehicle from among the many tactical vehicles, prisoner transport vehicles, and used armored SWAT vans we have in stock. We offer used armored SWAT vehicle and tactical vehicles as well as prisoner transport vehicles and much more from names such as Ford, General Motors, and Navistar, to name a few. 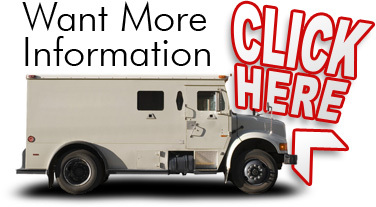 Our used armored trucks and used armored cars will be customized to meet your specific protection needs. Learn more about used armored vehicles from The Armored Group today. We'll help you find the used armored vehicle you need including bulletproof trucks, money transport vehicles, and used armored SWAT vehicle from the likes of Freightliner, Ford, and more. 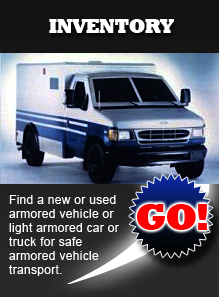 Trust The Armored Group, the first name in used armored cars and used armored trucks.